Brent Fikowski recently jumped onto a Reddit AMA, answering questions from the worldwide CrossFit® community. 1. What changes have you made this season to give you a shot at being the fittest man this year? I am training a lot more. spending more time training, more time recovering too now that I’m a full time athlete. putting way more hours into my craft. 2. What is your strategy for qualifying this year? A sanctional, Country (since Vellner just qualified in Wodapalooza), or Open? Sanctioned event in China this april! 3. My question is this: Do you believe, one way or another, that Crossfit is designed for a kind of ideal body type? With the inclusion of all types of movements and work/power application, it would seem that a less extreme body type would be perfect for the sport and the Froning/Fraser archetype seems to support that? body type> I mean yeah, like every sport there are going to be trends and there will be some common features of the athletes that have high level success. but there are always outliers. Just like basketball. It pays to be tall, but shorter guys can make it pro and be the MVP. Makes it all the more fun to challenge the norm. 4. How much is money a factor in your life now that you are a full time athlete. I think the thought of quitting a full-time job for many of us is scary, that steady income is comforting for a lot of us. Though you have won some big prizes through elite fitness, has the change from steady income/full-time job been a stress reliever or inducer? So yes I was an accountant full time while training and I got my silver medal at the Games still working full time. it was a flexible job at a tech startup, but full time nonetheless. then I moved to part time for about 7 months. then quit. I make some income from my sponsors, that income combined with prize money from competitions is enough to support the lifestyle I currently want to live. Previously I was so busy I was becoming very robotic in my life, very little fun or free time. Now I have a bit more free time which has been a welcome change. Still plenty of stress, and in a lot of ways this new fulltime athlete life is the most challenging thing I’ve ever done. But I am happy with the decision. 5. Can we talk PEDs? (Performance enhancing drugs) No one wants talk about PEDs. Do you think their needs to be a better job with testing? Do you think it’s possible athletes aren’t getting caught Do you think it’s an issue at all? hello “can we talk about the mail I’ve been DYING to talk about the mail” that’s a sunny in philly quote… anyway. Ya so I don’t like PEDs, I think it should be talked about more. I want to compete in a clean sport, one day i want to have kids and I want them to be able to compete in clean sports too. I would love for the testing to be better. Unfortunately the reality is that testing costs lots of money to do. I don’t know exacltly how much, but I think if you want a company that is reputable to come to your competition and test like 12 people with urine it costs about 30k USD? something like that. Probably more expensive if you want to test blood too which is a better way to test. Adds up if you are just trying to break even at a medium level event in a growing sport. Simple answer: i want testing to be better. I’d love it if everyone and anyone was tested all the time. Reality: that ain’t easy or cheap. I hope it keeps getting more and more thorough. Is it possible athlets are NOT getting caught? I mean ya sure. I honestly try not to think about it much becuase it stresses me out. I can’t control it, I don’t really want to lose sleep thinking “is my competition all juicing out of their minds and they’re going to annihilate me with their freakish-roid-strength the next time we compete”. Its just a waste of head space. Is it happening? maybe, probably, i dunno, i hope not. If you cheat gtfo I don’t want to see you or talk to you or compete against you. Go compete in a sport where taking drugs is legal or just don’t compete and keep crushing WODs in your home gym or something. 6. As a taller guy (I’m 6’2” myself) how do you prioritize nutrition and weight gain/loss with CrossFit? Do you bulk in offseason and cut for competitions or stay at a similar weight year round? I’m trying to find what weight works best for me and I’m wondering how a pro does it? I’m about the same weight all year, I might lose like 1-4 pounds leading up to a comp at the most. but I stay around the same, just try to add some more body fat in the offseason because its good for general health. Honestly I would find a dietitian to help you if you’re struggling to make sense of it. I use Target Nutrition Amie Cox, but find someone you like who you can create a relationship with if its important for you! 7. What do you think of all the changes HQ has made to competition and how athletes can qualify for the games? I mean I try not to get to wrapped up in what i think/feel about them. more what I need to do to succeed in the new system. BUT.. I think this year in almost all criteria the season will be worse. Not by a massive amount, but I don’t think it’ll be better/fairer/more exciting etc etc. I hope/believe that in coming years this system has the potential to be far better than if they just stuck with the classic open/reg/games format. 8. What’s the largest animal you think you could (single handed) duct tape to a lamppost? Great question. a cow. they are slow. 9. How many calories do you consume per day? Getting to the gym when you don’t want to go. Once you’re there and warm up I usually feel like training! But some days like everyone I just would rather not. But 99.9% of the time I get there anyway and I’m always glad I do. 11. What made you choose the China Sanctional and are you planning on participating in any others this season? Will you participate in the CanWest Sanctional next year? China. It was a good time of year for me to compete my coach and I thought. and compared to a lot of the other events, from where I live the flight time is actually reasonable. Canwest: I don’t know.90% chance I will be there either to compete or spectate though. Not often a big time event is that close to home. 12. With your methodical approach to workouts, how was it going into the “Chaos” event last year at the Games? Have you prepared for that style of workout this year? That event didn’t go as well as I would have liked. I think most people felt that way once it was done. I will be more prepared (if that is possible) for events like that in the future. Learned a lot from Chaos in 2018 for sure. 13. I don’t mean any disrespect because you are an amazing athlete and a good dude, But, Is there anything that can get you an edge on Fraser? Every year people say he is beatable and he seems to pull away even more. 14. Hardest workout you’ve done? Oh man. there are a lot! Probably 7km trail run day 1 event 1 2016 games. I was peeing uncontrollably after. hallucinating. couldn’t talk. overheating. the works. I was not OK.
15. What were your favourite events each year you’ve competed at the CrossFit Games? 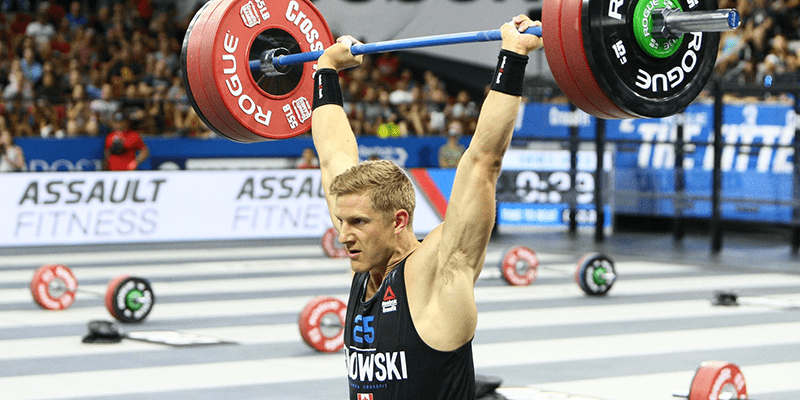 Brent Fikowski is a 3-time CrossFit Games athlete and the 2017 2nd Fittest Man. He has placed 1st at Regionals for 3 consecutive years and has added two 4th place finishes to his impressive CrossFit Games resume. Nicknamed the Professor for his unique analytical approach to workouts, competitions, and training methodology, Brent started his CrossFit journey in order to improve his skills as a volleyball player, and has since transitioned into being one of the top CrossFit athletes in the world all while maintaining a full-time job. In late 2018, he switched to being an athlete full-time. Along with his switch to being a full-time athlete, Brent has released The Professor Project a resource for CrossFitters with tips and tricks to help them excel in their movements. Brent will be providing his insights on movement techniques, workout strategies, and mental grit to help athletes improve their competitive game. While doing this, Brent relies on his experience, and the experiences of others as he brings in coaches, nutritionists, and other CrossFit athletes.